Yokohama-based Shingo Matsunuma, otherwise known as Shichigoro, brings the light of fantasy into the dark world of gothic art. Somehow, his man-machine hybrids, robot fish and transformed animals always fascinate without ever being truly disturbing. “In my world,” Shichigoro says, “there is no fear; no fear of creatures, no fear of machines”. 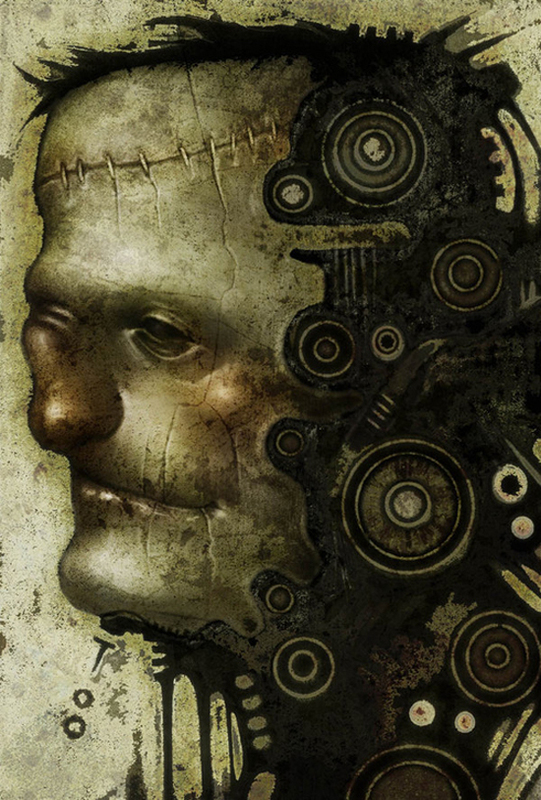 Shichigoro’s Frankenstein Monster is an impressive steampunk creation, an extreme amalgam of flesh and metal but, still, he is a stoic, patient creature, and you will note the hint of a smile on his cracked lips. Shichigoro keeps a fine website filled with wonderful art. The artist’s quote is from an article in Walking Blind magazine.